Polystyrene foam, better known to society as Styrofoam, is a widely used hydrocarbon material. This non-biodegradable synthetic material is widely used in the manufacturing of packaging materials. It is produced in three different forms: general purpose polystyrene (GPPS), high impact polystyrene (HIP), and expandable polystyrene (EPS). The processes in creating these products are energy intensive and rely greatly on petroleum. As environmental issues arise due to increased production of oil-based products, natural compounds of biological matter are being put to the test for biotechnological use. Mycological fungi, a renewable biomaterial, are competitive in replacing plastic foams. It allows for low cost production, lack of oil feed-stock usage, and carbon-neutral or carbon-negative products. Mycological fungi are on the rise among biomaterials as they are fast growing, non-toxic, and sustainable. Displacing synthetic materials is a step towards greener, energy efficient production and sustainable products. As previously stated, polystyrene products are energy intensive and rely heavily on petroleum. The production of one cubic foot of EPS contains the energy of 1.5 liters of petroleum. EPS has a short life span, being used and discarded within minutes to hours, adding significantly to solid waste disposal; because this material takes thousands of years to decompose, it consumes roughly 25% of space in our landfills. In the United States, 855,112 metric tons of polystyrene are produced every year and the recycling rates of these materials are less than 2% due to cost inefficiency. It is a popular material for shipments as it provides superb insulation and protection at a low cost; however, it posts harmful health and environmental impediments, increasing the need for alternative constituents. 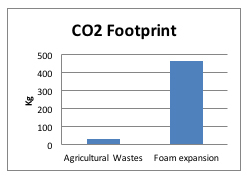 In conclusion to this comprised data, mycelium material is a competitive alternative to polystyrene foams. It offers a non-toxic manufacturing process, lower manufacturing costs, carbon neutrality, and is 100% biodegradable and sustainable. These materials can be used to replace synthetic packaging materials, insulation, acoustical tiles, and much more. It is an overall, breakthrough material with benefits to the environment and future generations. Myco-material and polystyrene both use energy and release CO2 during their production process. 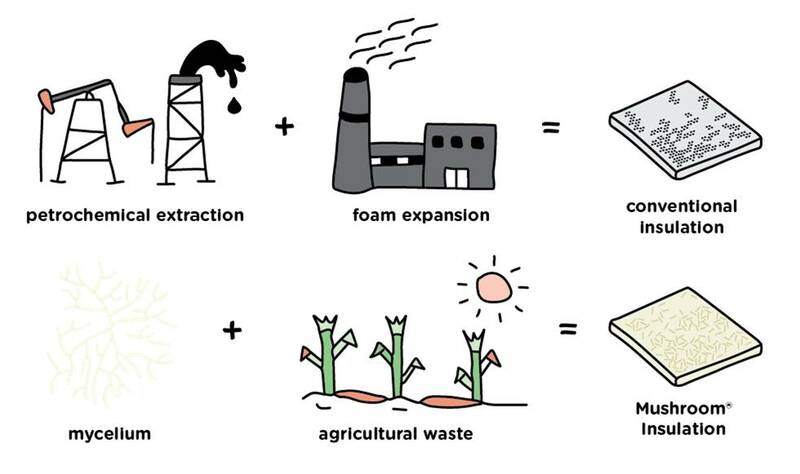 Myco-material uses agricultural wastes while polystyrene uses petrochemical extraction. To produce 1 m^3 of polystyrene, 4,667 megajoules (MJ) of energy are used and 462 kg of CO2 is released into the atmosphere. 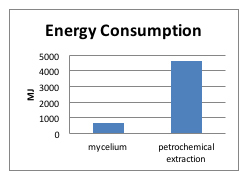 On the other hand, the production of 1 m^3 of Myco-material uses 652 MJ and releases 31 kg of CO2. After analyzing and comparing Polystyrene, a hydrocarbon material, and Myco-material, an up and coming biomaterial created from mushrooms, much remains unknown. Because this mycelium based material has only been on the rise since 2007, there are gaps in the data. Scientists and Ecovative entrepreneurs are still working on bettering the project and forming a complete Life Cycle Assessment. It is, however, known that this material is already comparable and competitive where it stands now to Polystyrene products. 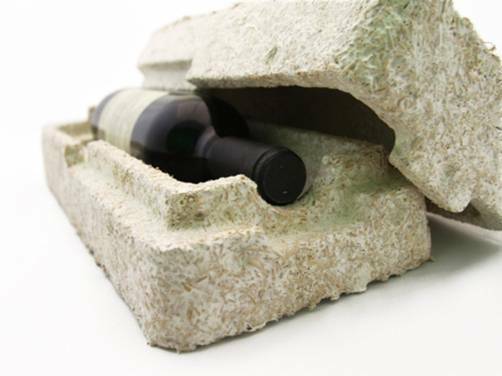 Mycelium packaging is already used to ship many wine bottles. Overall, this innovative mycelium based product is paving the way to mitigate health and environmental issues caused by Styrofoam. Although there is still much work to be done to fully equate the two materials, mycological natural composites are shown to have the potential for replacing Polystyrene foams. A complete life cycle assessment of the fungal biomaterial must first be released in order to properly compare these two products. As researchers, scientists, mycologists, and engineers continue working on the fundamentals of the upcoming myco-material, they are learning not only more about this superb fungi matter but about techniques to better the product. This material is an approaching technology with impending ramifications on the environment. PlasticsEurope. 2008. Environmental Product Declarations of the European Plastics Manufacturers. Polystyrene: General purpose and high impact. Hilton, Brian. 2013. “Using LCA to Prioritize Process Changes: A Mushroom Packaging LCA Case Study”. Rochester Institute of Technology. Fish, Emily. 2013. “Expanded Polystyrene and a 100% Compostable Alternative”. Ullman. David. 2014. Designing with Mushrooms at Ecovative: A Case Study for The Mechanical Design Process. 5th Edition. Worrell, William. Vesilind, P. 2010. Solid Waste Engineering. Planning, siting, and permitting of landfills. Ch. 4 pg. 103-110. Zeller, P. Zocher, Dena. “Ecovatives Breakthrough Biomaterials”. 2012. Fungi Volume: 5-1. Travaglini. S. Noble. J. Professor PG Ross. Professor Dharan. 2013. “Mycology Matrix Composites Proceedings of the American Society for Composites”. Twenty-Eighth Technical Conference. Thompson, Richard. 2013. “Plastic Entanglements Increase 40% for Marine Animals”. Ocean Health Index. Tess Burzynski is an environmental science major at Wayne State University in Detroit, MI. Her goal is to reunite mushrooms and mankind on a personal and environmental level. She conducts fungi research and in her spare time enjoys hiking, traveling, reading and gardening. She is founder of the Detroit Spore Co. Tags: agricultural waste, alternative energy, biomaterials, compostable, Detroit Spore Co., ecovative, environmentalism, female and fungi, fungi, green energy, green technology, hydrocarbon material, innovative, mycelium, mycelium material, myco material, myco-packaging, Mycology, petroleum, Tess Burzynski, Women in Mycology. Bookmark the permalink. A nice article Tess – thanks! It is interesting to see more companies using sustainable and biodegradable biomaterials like hemp and jute bast fiber, and mushrooms, as a Polystyrene (Styrofoam, EPS) cold chain packaging insulation material replacement. Hopefully one day more hemp grown in the US or NC will make its way into American food shipping supplies and other products too. More info about hemp can be found at http://votehemp.com or http://americanhempllc.com.